Insects can cause substantial damage to stored grain. In addition, consumers and therefore food processors are increasingly interested in chemical-free products. Integrated pest management (IPM) may increase farmers' profits while reducing their use of pesticides. 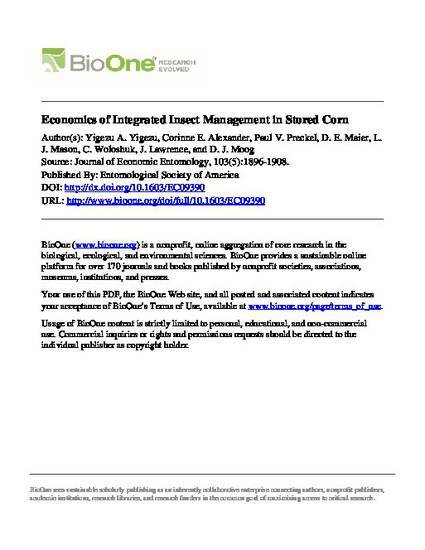 This study uses a stochastic dynamic programming framework to model the economics of optimal insect control in corn, Zea mays L., stored on-farm with multiple controls conditional on the biophysical conditions of the grain in the bin. We find that for farmers who have a contract with a food processor, where there are quality premiums, the optimal management strategy depends on monitoring the biophysical conditions of the grain and the time period under consideration. For farmers who deliver to the commodity market, their current practices are optimal.